HXRT Rubber Pads are manufactured with a Heavy Duty Premium Rubber Compound. Providing good traction, isolation of machine vibration for the operator and protects against accidental electrical discharge. 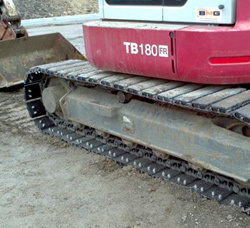 Rubber Pads allow you to diverse your steel tracks excavators machine giving you the option to operate on Roads or Concrete surfaces. "OUR RUBBER PADS ARE NOT MANUFACTURED WITH RECYCLED RUBBER"
Please Note: "We deliver throughout Victoria & will arrange freight if you're outside of Victoria." Copyright © 2013 Rubber Track Plus. All Rights Reserved.